Recently, AHDB attended a conference hosted by Kantar Worldpanel aimed at highlighting how the mature dairy category can find new shoppers. From their long-term observation of consumer behaviour, gaining new shoppers is one of the key tenets of brand growth. The presentations highlighted areas on which dairy manufacturers should focus their attention in an increasingly uncertain and ever-changing retail landscape, to add value to their businesses. So, how should dairy find new shoppers? Finding new shoppers isn’t easy – if it was, everyone would be adding to their shopper base. There are no simple solutions, but the easiest way to attract shoppers is through giving people more reasons to buy. At present, 62.5% of meal occasions feature dairy. 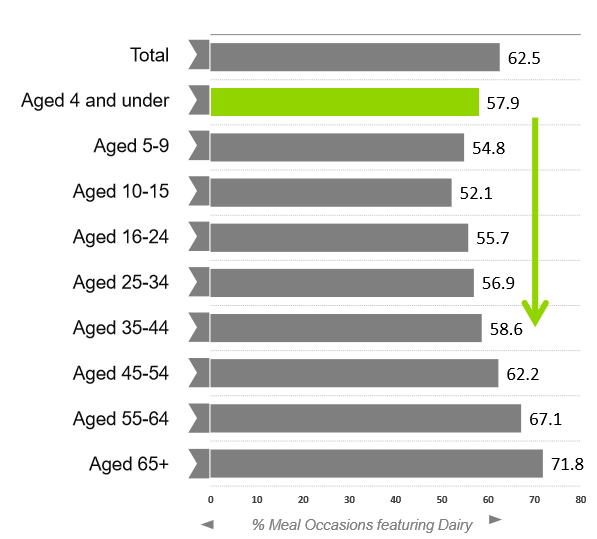 This differs by age and shows that the user base is not always the person who purchases the product, with children (particularly aged under 4), having one of the highest dairy consumption levels. This highlights the need to think about targeting the influential end user of a product as well as the shopper. Manufacturers need to appreciate individual shopper groups and recognise the differences between them, targeting them at the right meal occasions to meet their needs. In a saturated and competitive market, we need a balance between personalisation and optimisation of the right number of variants/ranges. To drive success, manufacturers should not only understand who their shopper is, what they think and where they shop, but calculate whether their product portfolio is successfully meeting their needs. Across the Top 20 Dairy brands, 45% of products are attracting less than their expected share of buyers. Therefore, brands need to be focusing on rationalising their product ranges to the most profitable high-penetration products. Out-of-home snacking is declining due to expense and health concerns. Out-of-home dairy snacks are dominated by ice cream, admittedly booming due to the hot weather, but is there an opportunity for health-focused dairy snacks? Evening meal occasions are thriving, benefiting the dairy category, but can dairy maintain this momentum through innovative and creative dairy-based meal options? Health now drives one-third of in-home consumption choices, with 73% of consumers claiming to ‘try to lead a healthy lifestyle’. Health can mean different things to different people, with health ‘benefits’, lower in fat/sugar/salt, and natural/less processed being prominent. This is impacting shoppers’ baskets, with healthier baskets growing over the past five years. But they are still a long way off meeting dietary guidelines. This means that, as Government action intensifies, manufacturers will need to forward plan their innovation pipeline with healthier options, functional benefits, such as gut health and product reformulations that target more than simply sugar content. Figures provided by Kantar Worldpanel 2018.